There are many books on the market that claim to tell the budding writer how to write, but few that provide deep insight into the myriad ways that writing actually occurs. 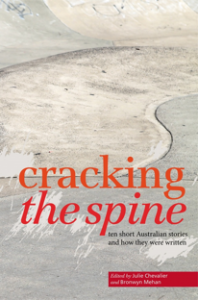 Cracking the Spine, part short story collection and part theoretical essay collection, fills a gap in the market that sorely needed to be filled. The book begins and ends with two extremely well known Australian writers of short fiction, Ryan O'Neill and Jennifer Mills. O'Neill's contribution, 'An Australian Short Story' is a pastiche of the Australian fictions which have come before it, and is made up of collaged lines borrowed from famous and well-loved stories. Ostensibly, the story is that of a failed relationship, but the plot pales in importance when compared to the impact of the structure of the story. At the other end of the book, Mills' story, Architecture, brings the collection firmly into this century by drawing a comparison between the architecture of a modern city and the complicated structure of the online world, as demonstrated by the fact that her main character is recruited to design a city for a Chinese businessman based on who she knows on Facebook, and the artifice she has created for herself there. Other notable stories include Maria Takolander's Three Sisters, which is a sort of ode to Chekhov, Tony Birch's Cartography, in which the actual displacement of a migrant child is put in context by his documenting his view of the world in hand drawn maps, and Rjurik Davidson's Twilight in Caeli-Amur, which explores the literary capabilities of the speculative fiction genre. Each story in the collection is accompanied by a short essay by the writer which goes into some detail on the matter of the story's creation; its inspiration, authors who have influence the writer's style, difficulties, right down to whether or not the writer likes to write on a computer or with a pen and paper. Even with those stories I felt no connection to, these essays proved invaluable to me as a writer determined to master the craft of short story writing, and I have no doubt that I will be recommending this group to others in the near future. I would also recommend this book to anyone studying modern Australian literature, as many of the essays provided insight on how stories should be read, and from what angles they might be interpreted, to better understand what they are doing and how.